If you eat meat, you’ll love my Oma’s goulash recipe. A bold claim, I know, but I have evidence to back it up. Not only was this a favorite dish of mine as a kid (whether cooked by my Oma or my mom), but it was even a regular request from my brother, a picky eater who went through single-food phases in which he’d eat nothing but ravioli or mac-and-cheese. 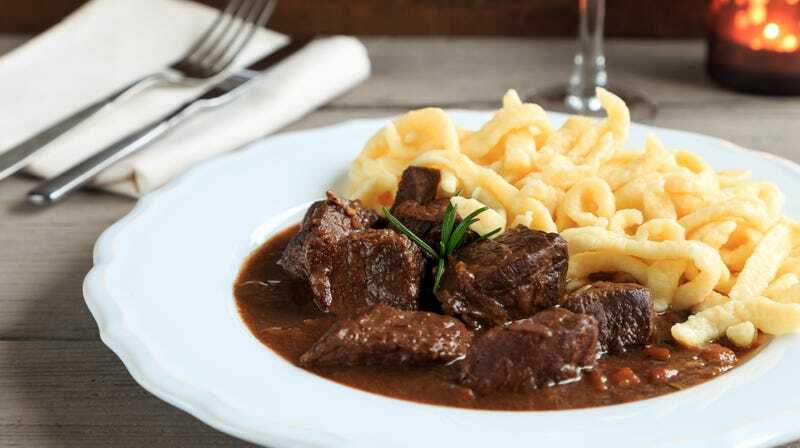 Or goulash, served over spaetzle. Goulash is a beef stew or gravy that’s a staple of Hungarian, German, and central European cuisines. Though my Oma grew up in Bavaria, the liberal use of Hungarian paprika in this recipe would suggest origins to the east. (When I recently found out that this pasta-and-tomato business is considered goulash in some parts of America, I was nearly apoplectic.) Regardless of where true, beef-stew goulash originated, it’s loved beyond those borders. Goulash was a wintertime staple of my childhood, but I’ve found it’s just as appealing to me now. That’s a bit surprising, because I don’t cook much meat. This despite the fact that I live with a hunter who stocks our chest freezer with venison, caribou, and homemade sausages derived therefrom. When we’re sketching out our weekly meal plans, he’s always the one who gently suggests that we cook a meaty dinner, even just once a week? I have no beef with meat, I just gravitate toward veggie- or seafood-heavy cuisine. That I paired up with a steak-loving hunter is a source of much good-natured teasing from friends. But goulash is a dish that brings us together, somehow. Beef stew might not sound classically romantic, but it draws us both into the kitchen, lured by the aroma of simmering stew and a plate of spaetzle that invites sneaky pre-dinner snacking. Goulash is hearty enough to please my partner, nostalgic and comforting enough to make it one of my favorites. If you’re also cooking to please a meat-lover but are intimidated by something like a steak or pork chop, maybe I suggest a giant batch of humble beef stew? If it’s good enough for a hunter, a veggie-lover, and one of the pickiest kids I’ve ever met, it’s sure to find fans in your kitchen. Sauté onions in olive oil and butter in a heavy-bottomed Dutch oven until glossy. Add vinegar at the end to deglaze the pot. Remove onions to separate bowl, but do not drain the pot. Add beef cubes and brown them over medium heat. While they’re cooking, sprinkle some flour over the meat, but not much more than a few pinches. Add onions back to the pot, along with ketchup, bouillon water, paprika, salt, and pepper. Cover and let simmer, stirring occasionally until cooked through. Serve over spaetzle or egg noodles. To make goulash in the Instant Pot, use the sauté function to cook the onions and brown the beef (same directions as above), then after adding all the ingredients to the pot, cook everything on the “soup/stew” function for 20 minutes. Release pressure manually, and serve.